To Em Dash or Not to Em Dash? Using an em dash, or not, came up after my last post. I had decided to use an em dash to add a splashy effect, because I think em dashes are neat and under-used (at least correctly). My darling husband, had the opposite view point. An em dash should be used with no spaces between it and the word(s) that it modifies. The em dash can be used in pairs: He was looking for treasure—buried treasure—along the coastline. Or on their own: He finally found what he was looking for, a chest buried in the sand—it might contain enough gold to raise a fleet! (I like pirates.) Just make sure you use them in the appropriate setting, or people will get fussy. There are many people out there that hate the em dash. I agree that it has been, and can be, over used, and there are many people out there that don’t know how to use it correctly and place the little buggers willy-nilly throughout their text. I think, with the proper usage, they can be a highly effective tool to enhance your writing. Plus, they look cool. One of the many problems with em dashes, is the fact that they are old fashioned. There isn’t a em dash key on modern keyboards, in fact, people used to use two hyphens in a row instead of an em dash. I don’t know if there has ever been a key specific to our little em. It is easy to get around this. 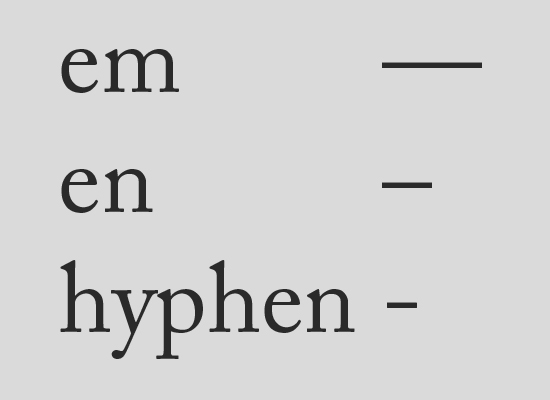 Most Word programs will automatically change a double hyphen into an em dash, and if you are a Mac user, there is a short cut: SHIFT, OPTION, and MINUS key. Voila! Em dash. For PC users, it’s ALT+0151. There are many famous authors who love the em dash, and there are many famous grammarians who hate it. In my opinion, both points of view are valid. Just remember, use it sparingly, use it for emphasis, or interruption, and find your own writing voice. Thanks for reading, and please share. This entry was posted in Grammar Grit and tagged em dash, emphasis, grammar, how to, hyphen, interruption, pirates, usage on March 25, 2013 by Dylan Benito.